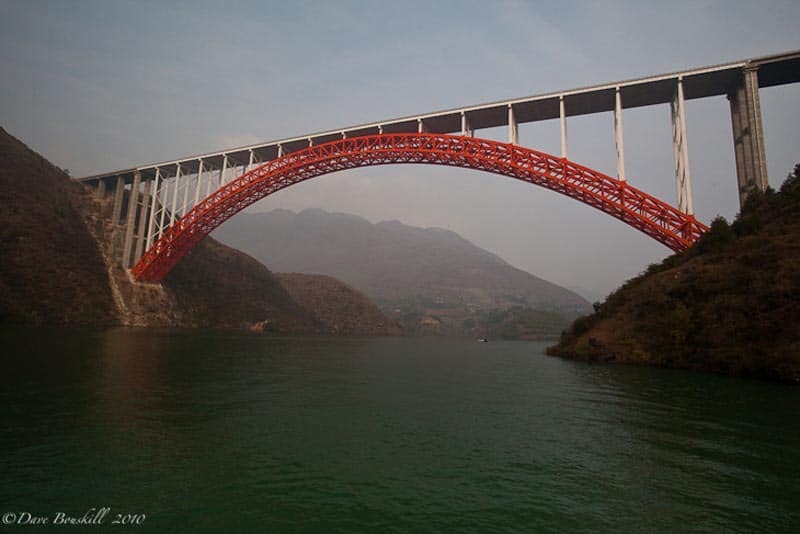 The Three Gorges is a must do trip when traveling to China. 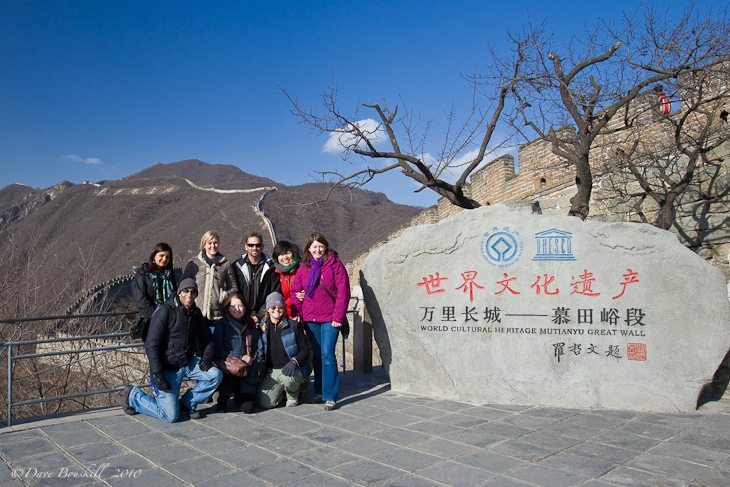 It goes along the Yangzi River where you will witness ancient history meeting rapid high tech development. 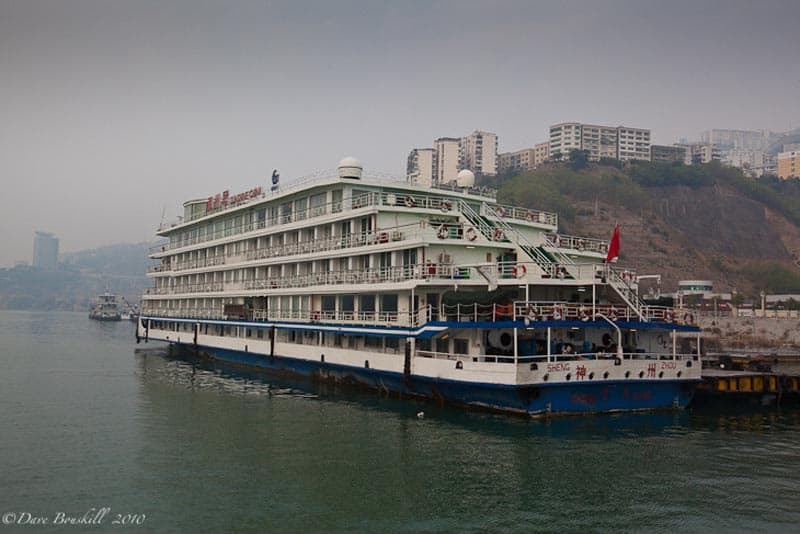 I hadn’t really thought of our Three Gorges trip as a proper cruise, but when an older English woman approached me in the lounge to ask if I cruise often, it hit me that this river excursion is part of the cruising society. It was only 3 days, but yes, it definitely felt like a cruising environment. Our Intrepid Travel Group of seven seemed oddly (and happily) out of place on a boat filled with giant bus tours of retirees. One group had 41 people in it! Our Yangzi River Cruise through the Three Gorges was an enjoyable break. We floated lazily down the river, but the Three Gorges themselves are quite unspectacular. The flooding of the Three Gorges Dam has submerged ancient cities to the deepest depths of the Yangzi River and turned the formerly great cliffs into diminutive hills on the side of a riverbank. 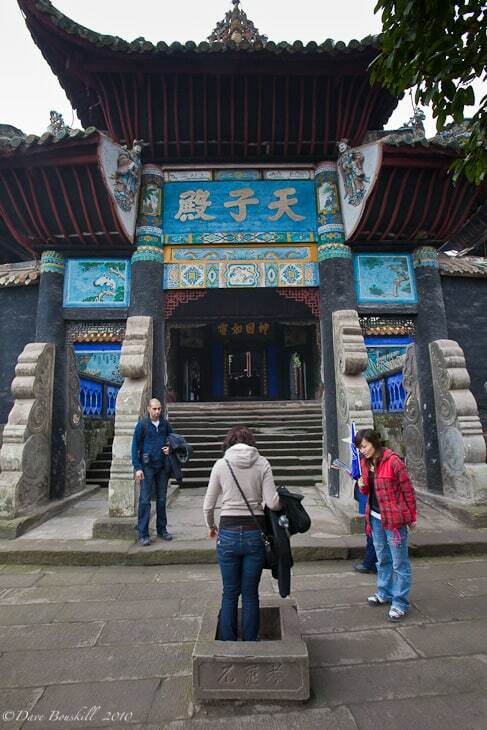 Day one of the Three Gorges Cruise, took us to Chengdu, The City of Ghosts. Buildings were under construction and nothing was authentic or even remotely old. Everything has been rebuilt and replicated. The original City of Ghosts is underwater and the Chinese don’t even try to pretend that the new city has anything original in it. I was ill during this day, so you are going to have to read more about Fengdu, the City of Ghosts by Dave. He soldiered on without me and shares his story about the tour here at The Three Gorges Ghost City. Day two took us to the Little Three Gorges. This has far more attractive scenery and everyone should make an effort to see them. They are usually the included excursion on from the cruise and are definitely worth a look. 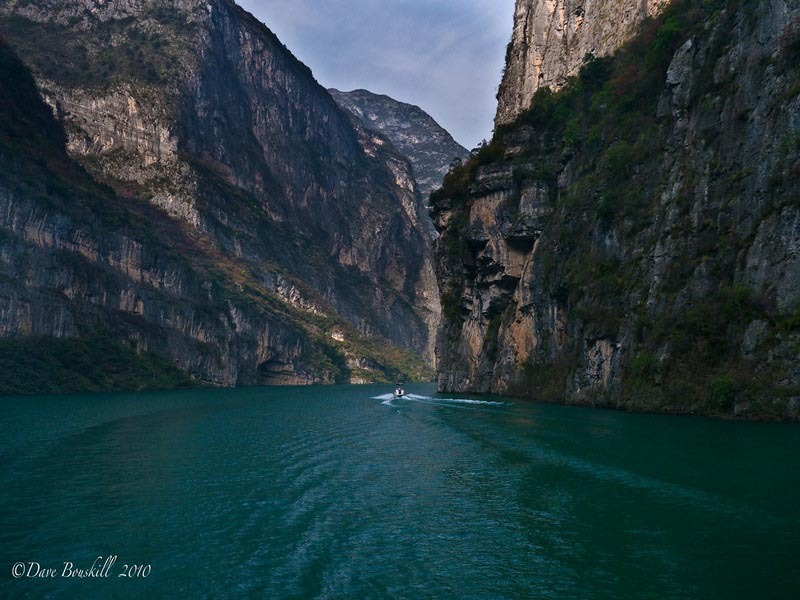 The trip to the lesser three gorges moves to a smaller boat with a tributary of the Yangzi River. The Gorges are quite high and still impressive even after the flooding. It used to be that the water was very low and men would have to pull you through the river, but now it reaches 70 meters deep and boats fly through the vast river. You will see ancient hanging coffins, shiny new bridges, farmers, villages and newly built cities. The tour offers contrasting views during its three hours. I talked to a guide that said he had been coming here since 1992 and finds the Little Three Gorges cruise better now because we can go much farther up the river. He showed me the original turn around point that was only half as far as we now go. The tour was informative as our guide spoke over a loud speaker strapped to here waist telling us about life in the villages. Many people have been relocated and have lost their livelihoods. But, tour guides keep telling us, that they are happy and that life is better being relocated in to the generic cities that now line the Yangzi. Farmers were given 200,000 Yuan (30,000 CAD) in compensation if they had 10 or more people in their family, less for smaller families. They had to buy their new houses or apartments with that money. Tour boats never seem to stop in these towns and there isn’t a lot of industry besides coal and fishing. 80 percent of the 30 million people that live in the area are farmers and now they are relocated to large apartment blocks built beside the river. Their children have gone off to the cities to work and the parents are left to live out their days in small boxes with unfinished windows and second floors. Our guide on the larger Three Gorges pointed out a village whose people were relocated to over 1,000 km away. The inhabitants didn’t adapt well to their new life and returned a year later to form another village on the river. They have a smaller plot of land, but at least the government allowed them to return. There is no running water or electricity, but it is the only life they have known and to be relocated so far away from the land that had been in their family for generations was too much for them to handle. 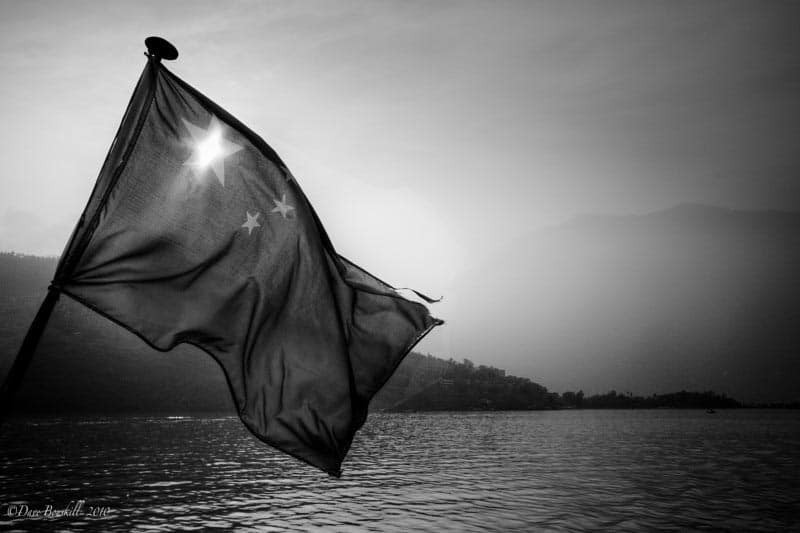 China is embracing the new and doing away with the old at lightening speed. While some people are suffering from the change, others are thriving. 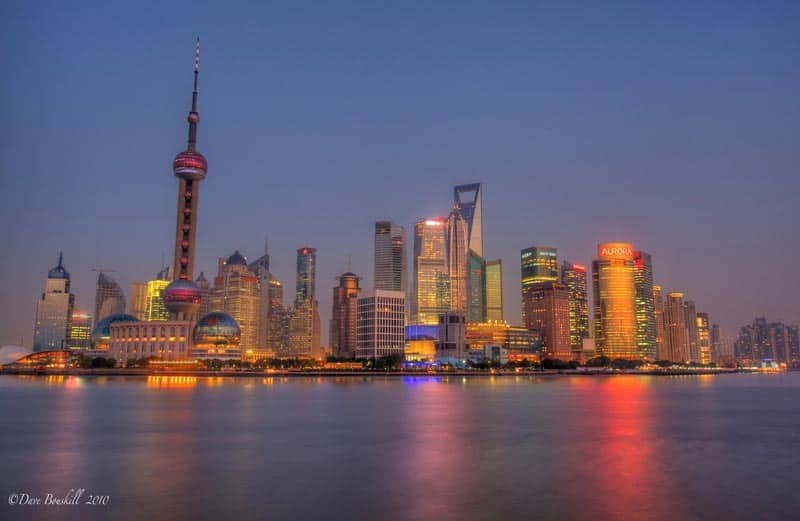 Roads and highways are being built connecting these new cities with the rest of the China, Tourist are flocking to the area and buildings are rapidly being constructed. While life is tough for those in the middle of the transition, it might be more prosperous for the future generations. Flooding of the Three Gorges for a Better Future? While I can’t understand why a country would flood cities with thousands of years of history and I can’t even imagine the environmental impact, I can understand why China went ahead with the Three Gorges Dam project. There is a large divide between East and West. The West had its industrial revolution a century ago and has reaped the rewards for decades. We have lived a life of comfort and prosperity. It is China’s turn now. And while we would like for them to learn from our mistakes and look into ways of growing without the environmental impact that they are creating, who are we to keep people from having heat and air conditioning and driving cars and having the creature comforts of life? In the next few years, China will be building 12 more dams and 30 nuclear power plants. 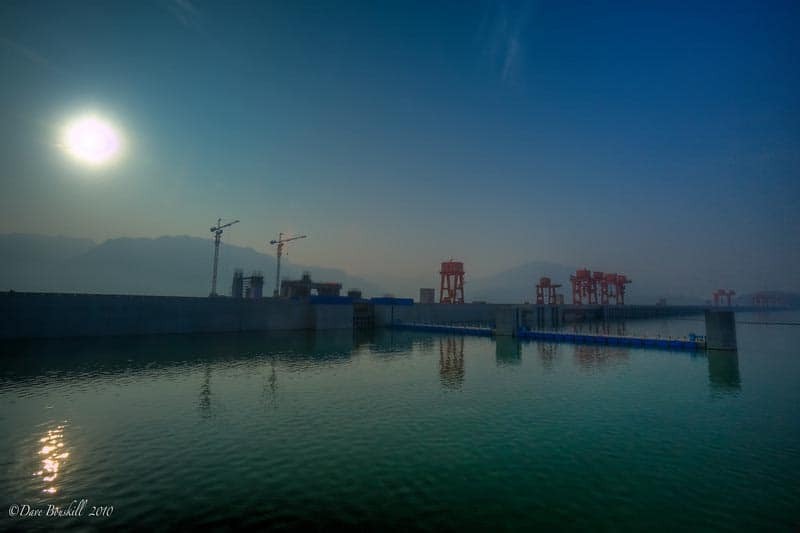 The Three Gorges Dam was expected to supply 10 percent of China’s power when they first started building it in 1994. With the rapid growth of China’s energy consumption, it is now only supplying 3 Percent. When the other dams are built, it will only give China 1 percent of its energy. However, the Three Gorges has also opened up an entire shipping lane to the heart of the country. While it was going to be a large energy source, it is now an avenue for trade and industry. The world is changing and as much as we would like it to stay the same, it is impossible. Whether it is good or bad, that remains to be seen. 10 Responses to "Three Gorges, China’s Rapid Development on the Yangzi River"
Thought provoking post. I am having the same struggles over our tendency to impose American values on emerging nations. How can we expect them to be concerned with environmental issues, or stop their children from working in factories, when they do not even know where their next meal is coming from? It is a dilemma and you presented the case succinctly, while also featuring your usual stunning photos. .-= Barbara Weibel´s last blog ..Three Views of Pokhara- Nepal Capture My Heart =-. Thank you Barbara. I always appreciate your feedback and I am glad that you found my thoughts clear and easy to understand. Sometimes I ramble and try to get my point across, but I am never sure. Especially when it came to the Three Gorges. It is a dilemma for sure. People are starting to enjoy the finer things in life in China and we in the West are telling them that they have to stop. I don’t know how to slow down progress without impacting the earth, but I do think something’s gotta give. I just wonder where it will be. Nice, informative post, guys! I have a Chinese daughter and we haven’t been back in China yet. But she’ll be 10 next year, so time for a proper exploration and this sounds like an interesting excursion. Lovely photos as usual, the Little Three Gorges look gorgeous. .-= Sophie´s last blog ..La Befana- witches and Rome’s Christmas Markets =-. I am digging that black and white photo, really nice. I don’t see myself as a cruise kind of person either but I haven’t been on one yet so I’m really curious. .-= ayngelina´s last blog ..How to make Peruvian ceviche =-. A place I have wanted to go for a long time. Didn’t have time last time through China. Will do it next time. Great review. .-= Michael Hodson´s last blog ..Cold Showers from Hell =-. Great Post! I love the juxtaposition between your words and Dave’s pictures. The shots of the gorge and the bridge–modernization at its best–are beautiful, but at what cost? It is tough to watch the destruction of history and culture, only to be replaced by prefabricated developments and the air conditioned nightmare. But who am I to judge, I still order off the $1 menu at McDonalds. Growing up near Pittsburgh, PA, in the 80s, I saw the devastation of over industrialization from the steel industry as well as the damaged it caused, and I hate to see the cycle repeating itself, again. I did this tour and it was life changing, loved it! Your pictures are gorgeous, especially the last one.